LG's 37LH7000 is handsome, but will its pictures match up to its exterior? 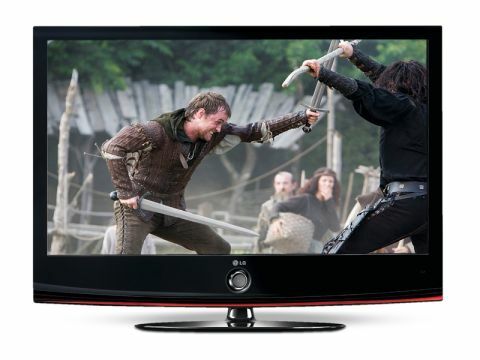 The 37LH7000 sits just off the top of LG's LCD range, right behind its Freesat models. But in typical style, that doesn't mean it is expensive. We've found it selling for under £800, which is strikingly little for what it offers. It's comfortably one of the the prettiest TVs, with its subtle red highlights, see-through bottom edge and high-gloss, ultra-minimal finish. Its exterior is distinguished by a prodigious suite of connections, including a whopping four HDMIs, a PC jack, and a USB port able to handle JPEGs, MP3s and DivX HD video. It even sports Bluetooth for wireless compatibility with suitable phones and headphones. Pictures benefit from LG's 100Hz TruMotion, which interpolates new frames of image data to improve motion sharpness and smoothness. Setup reveals a prodigious suite of picture controls. There's a huge colour management system, noise reduction aplenty, multiple black level boosters and tonnes more. The 37LH7000 is so flexible it's been approved by the Imaging Science Foundation, meaning you could pay one of its engineers to visit you and perfect your picture settings. If all this flexibility sounds scary, fear not. For the 37LH7000 thoughtfully provides a Picture Wizard utility comprising various test signals and onscreen instructions on how to use them. Thankfully, the 37LH7000's pictures don't prove an anticlimax. In fact, they're frequently quite spectacular. Colours, for instance, are exceptionally vivid, making vibrant sources look truly eye-catching. But colours are also naturally toned and subtly blended. The 37LH7000's 100Hz engine works nicely too, making motion look strikingly fluid and sharp. And so long as you only set TruMotion to Low, you get the motion benefits without suffering many of the flickering, shimmering processing artefacts witnessed using higher TruMotion settings. Black levels are arguably LG's best. There's still a slightly blue tinge to really dark scenes, but this is much less noticeable than usual. If the TV has a flaw, it's that HD images don't look as crisp as we know they can. For us, this problem is largely compensated for by the set's impressive motion handling, but it's still a pity it can't quite do full justice to HD material. Sonically the 37LH7000 is rather run-of-the-mill. There's plenty of sparkle at the treble end of the audio register, which helps a detailed soundmix sound busy and involving. The mid-range sounds reasonably open, too. The problem is there's not enough bass around to effectively balance the trebles, resulting in a rather harsh, hissy tone at times.